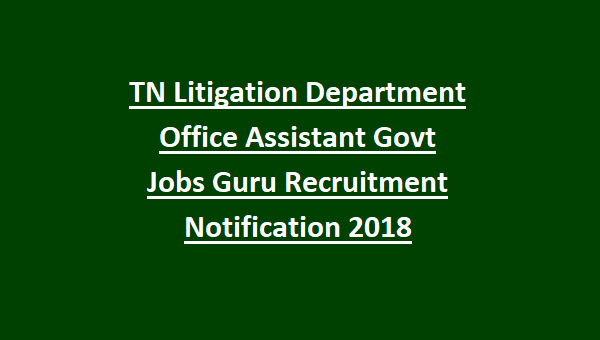 A total of 28 vacancies are to be positioned at Office Assistant Post under Litigation Department of Tamil Nadu. Refer the official notification for category wise bifurcation of vacancies. Candidates applying for jobs through TN Litigation Recruitment must not exceed the upper of 30 years as reckoned on 01-07-2018. Candidates interested to join Assistant Staff at Litigation Department must have passed 10th class with valid light motor vehicle driving license. Candidates who have successfully applied for the desired post at Litigation Department will be assessed on the basis of Written Examination and Skill test. 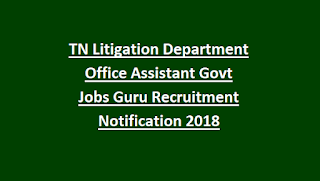 Candidates interested to join Department of Government Litigations as Office Assistant must send the duly filled application form in the prescribed format along with necessary documents on or before 22nd October 2018 to the office address of Government of Litigations, Tamil Nadu.